Graph showing temperature connections between solar activity and volcanic eruptions, against a backdrop of historical events. Anthropogenic global warming (AGW) is a theory that suggests that human activity is causing the Earth to warm. The theory posits that greenhouse gases, including carbon dioxide, methane, nitrous oxide, and water vapor, trap solar warmth on the planet. Computer models suggest that industrial and vehicular emissions could lead to catastrophic warming. Leftists use this theory as a basis to propose cuts in energy production and consumption and to promote de-industrialization. AGW theory predicts that the lower troposphere should be warming at a rate of 3.1 degrees per century, according to an average of 102 climate models used by the Intergovernmental Panel on Climate Change (IPCC). Satellite data shows that the lower troposphere warmed at a rate of 1.3 degrees per century between 1978 and 2019. Weather balloon data shows a warming trend of 1.6 degrees per century between 1958 and 2018. An analysis of weather station data by U.S. climate researcher Roy Spencer shows no significant warming since 1943. Unlike the official weather station record, Spencer's data includes only those stations that recorded temperature at a consistent time of day. The heating predicted by AGW but not detected in the temperature record is sometimes said to be accumulating in the oceans. But a study by the Scripps Institution of Oceanography found that ocean temperature has risen by only 0.1 degree Celsius in the last fifty years. 8.2 Liberal claims of "consensus"
Carbon dioxide is insignificant as a greenhouse gas. The level of CO2 in the Earth's atmosphere is only 400 parts per million. Ninety to 95 percent of the greenhouse effect is due to water vapor. The IPCC claims that water vapor acts as a "positive feedback," i.e. warming creates more humidity, which leads to additional warming. There are humidity measurements going back to 1948, and they show no upward trend. More humidity could lead to more clouds and therefore to cooling and to negative feedback. So why assume positive feedback? AGW works only if water vapor is a positive feedback, so that is what the IPCC must claim. Although Obama has denounced elevated carbon dioxide levels as "carbon pollution," greenhouse operators commonly increase the level of CO2 to 1,000 ppm or more to enhance plant growth. A composite map of Antarctica showing areas of greatest warming in red. The Wilkins Ice Shelf lies off the peninsula in the top left corner, and shows extensive warming. Overall, Antarctica shows little warming, and many areas to the East (right) are almost cooling. The Earth has warmed or cooled many times. Historically, warm periods are associated with favorable climate. The Roman Warm Period (250 BC to 180 AD) featured temperatures comparable to those of modern times. This was followed by the Dark Ages Cold Period (450-950 AD). The Medieval Warm Period was even warmer than the Roman period and lasted from 950 to 1300. From the 14th century to the early 19th century, there was a Little Ice Age. For leftists, the attraction of the theory is that it supports their agenda. The environmentalist agenda of renewables, solar energy, conservation, and world government was put together in the 1970s in response to the energy crisis and to the overpopulation scare. At that time, most scientists thought the Earth was cooling. When AGW came along, it was treated as an additional justification for this agenda. Steven Schneider, founding father of the AGW movement, was a global cooling believer in the early 1970s. "We have to offer up scary scenarios, make simplified, dramatic statements, and make little mention of any doubts we might have," he explained. To Schneider, global cooling and global warming were just two "scary senarios." He could offer up whichever one was expedient. Carbon dioxide can be absorbed by promoting plant growth, an angle overlooked by the mainstream media. In fact, the increase in carbon dioxide in the atmosphere has already resulted in an increase in plant growth. If that's not enough, iron filings can be dumped at sea to encourage the growth of marine plants. Freeman Dyson, America's top physicist, has suggested genetically engineering trees to absorb more carbon. If the science was in fact settled, we would see less outrage at "deniers" and greater concern for scientific integrity. One climate science scandal after another has been exposed. The Climategate emails show hoaxers scurrying to "hide the decline." The "hockey stick" view of climate history, which holds that global temperature was constant for 2,000 years and then surged in the last century, has been repeatedly debunked. No one's reputation is tarnished by these bloopers, no one pays any price. The first response of AGW backers is name calling and attempts to shut down the discussion. Argument is a last resort. The logical explanation is that they already know AGW is a hoax, and they don't care. Although alleged climate scientists claim the theory of global warming dates from the 19th century, it gained its modern impetus among the socialist totalitarian Left in the 1980s. Unable to compete economically with The West and President Ronald Reagan's defense modernization program, which ultimately bankrupted the Soviet Union, anti-capitalists in the United States and Europe began attacking the booming auto manufacturing, oil drilling and refining industries as responsible for destruction of the planet. This leftwing socialist sentiment was taught in schools and universities, where faculty salaries are dependent on statist largesse. The Soviet KGB, known for its propaganda campaigns such as the AIDS virus invented by the Pentagon, mounted one last ditch effort to save communism and fight capitalism. In a limited way the communists were successful; the global warming scare was a factor in the de-industrialization and transfer of Western factories to the developing world where environmental and labor laws were less strict. The free trade movement and globalization was partly justified by the politization of science and global warming. In 1827, French scientist Joseph Fourier suggested that although the atmosphere allowed sunlight to pass through to warm the Earth, it blocked "dark heat" (infrared radiation) from the Earth and thus prevented energy from being transferred back into space. Fourier did make an unfortunate analogy between the Earth's atmosphere and a space enclosed by glass. All the same, it may not be fair to blame Fourier for the greenhouse effect meme. He also discussed convection as an alternative explanation and, as a good scientist, recommended an experiment to resolve the issue. In 1861, Irish scientist John Tyndall measured the absorption of radiant energy by various gases in the atmosphere. He concluded that water vapor was the gas primarily responsible. It could therefore be considered the warming agent that Fourier hypothesized. Tyndall suggested that changes in humidity could bring about climate change. The AGW theory was first presented in 1896 in an article by Swedish scientist Svante Arrhenius. Arrhenius predicted that a doubling of CO2 in the atmosphere due to fossil fuel burning would lead to a temperature increase of 3 to 4 °C (about 5 to 7 °F) after 500 years. Arrhenius attributes his misunderstanding of the science to Fourier: "Fourier maintained that the atmosphere acts like the glass of a hothouse." The use of the Swedish word drivbänk (hothouse) by Arrhenius and his colleagues is likely to be the origin of the phrase "greenhouse effect." This phrase is first recorded in English in 1907. Arrhenius ignored water vapor in his calculations, leading him to overestimate the effect of CO2 by 96 percent, as Knut Ångström observed in 1901. More controversially, Ångström questioned whether CO2 could act as a greenhouse gas at all. He took a tube of carbon dioxide, shined black-body radiation on it, and varied the pressure on the gas. Increasing the pressure led to only a slight increase in absorption. He concluded that radiation absorption by CO2 is already nearly saturated, so the emission of additional gas into the atmosphere would have little effect. Ångström thus became "the first denier." Nils Ekholm, an associate of Arrhenius, had an answer to Ångström's point about saturation. Ångström's tube was saturated because it was at ground level. High enough in the atmosphere, there must be an unsaturated layer of carbon dioxide capable of absorbing radiation. The greater the density of carbon dioxide in the atmosphere, the lower this layer would be. A lower layer would retransmit more radiation to the lower atmosphere and would therefore be responsible for greater warming. Ekholm's insight was lost on his fellow scientists. It was not rediscovered until the 1960s. As for Ångström's point concerning water vapor, Arrhenius insisted that CO2 rose higher in the atmosphere than water vapor could, so water vapor was not relevant. This argument never caught on. The idea that adding CO2 would change the climate, "was never widely accepted and was abandoned when it was found that all the long-wave radiation [that would be] absorbed by CO2 is [already] absorbed by water vapor," the American Meteorological Society concluded in 1951. Despite Ångström's debunking of his theory, Arrhenius won the Nobel prize for chemistry in 1903 for unrelated research. The Ångströms, meanwhile, are remembered for a miniscule unit of length named after Anders Ångström, Knut's dad. Finally performing the experiment Fourier had recommended a century earlier, Robert Wood showed in 1909 that energy is transferred from the Earth's surface to the atmosphere primarily through convection currents. In Wood's experiment, the temperature in a glass box was compared to that in a box with a top made of halite (rock salt). Halite allows sunlight to enter, but blocks infrared. Infrared re-radiation and the greenhouse effect play "a very small part," both in the atmosphere and in literal greenhouses, Wood concluded. A greenhouse is warmer than the air outside because the roof limits convection and the walls restrict wind. "The acquired heat is concentrated, because it is not dissipated immediately by renewing the air," as Fourier himself explained. From 1909 until the 1960s, only a few additional papers on AGW were published. Research went forward as the lonely project of English scientist Guy Callendar. Callendar collected historical temperature readings and CO2 measurements and published the results in 1938. In 1932, Venus was shown to have an atmosphere of carbon dioxide. This finding prompted astronomer Rupert Wildt to propose in 1940 that a greenhouse effect operated on the planet. Radio telescope observations in 1958 showed that the temperature of Venus was even higher than Wildt's theory could explain. Astronomer Carl Sagan proposed in 1960 that the planet had a “very efficient greenhouse effect,” or runaway greenhouse as it later came to be called. The Mariner 2 mission in 1962 measured the temperature of Venus as 500 degrees Celsius. The planet that had been considered "Earth's twin" just a few years earlier was revealed as a sulfurous vision of hell. Mariner's findings were sensational because they had been predicted by Immanuel Velikovsky in Worlds in Collision (1950), which argues that Venus was ejected from Jupiter in mythological times. The scientific community had denounced Velikovsky and his theory in the strongest terms, and Sagan emerged as its champion. Sagan and Velikovsky faced off at a dramatic conference in San Francisco in 1974. By portraying carbon dioxide as a doomsday chemical, Sagan put a radically new spin on the issue. Both Arrhenius and Callendar had assumed that greenhouse warming would be beneficial. With Rachel Carson's Silent Spring (1962), Paul R. Ehrlich's The Population Bomb (1968), and the Club of Rome's The Limits to Growth (1972), this was an era when the reading public had an enormous appetite for spurious theories concerning human-initiated global catastrophe. While the Venus discoveries ignited a burst of interest in AGW, they did nothing to shore up its scientific merits. In 1971, Russian climatologist Mikhail Budyko gave a speech to a large international conference in Leningrad in which he presented an alarmist AGW scenario. Reaction was strongly negative. It was clear that AGW was very much a minority opinion among scientists at this time. A quick look at Venus reveals that the atmosphere is opaque due to globe-spanning sulfur dioxide clouds. These clouds are 30 to 40 km thick. No sunlight reaches the surface. It follows that the planet has no greenhouse effect whatsoever. In a runaway greenhouse, the greenhouse effect vaporizes additional water, which in turn increases the greenhouse effect. This leads to even more water vaporization and so on in a cycle of positive feedback. Venus has very little water of any kind, so Sagan's runaway greenhouse is not possible. Whatever the chemistry of the Venusian atmosphere, water vapor absorbs a wider spectrum of radiation than carbon dioxide does and remains the primary greenhouse gas in the terrestrial atmosphere, as Tyndall showed long ago. Venus research proved to be an incubator for AGW showboaters. James “Boiling Oceans” Hansen, who emerged as the public face of AGW in the late 1980s, was a NASA Venus researcher in the 1960s. Overlooking Hansen's history of following one kook theory after another, the mainstream media treated his talk of "runaway greenhouse" and "Venus syndrome" as serious science. Hansen's claim that continued CO2 emissions will trigger a runaway greenhouse on Earth is unlikely in view of the Earth's recovery after the Paleocene-Eocene Thermal Maximum (PETM), a huge natural spike in CO2 that occurred 55.5 million years ago. During PETM, the carbon dioxide level in the atmosphere increased by about 700 ppm over 20,000 years and the planet warmed by 5–8 degrees Celsius. Plant growth accelerated and there was a return to pre-PETM conditions after 200,000 years. Although this event is sometimes presented as confirmation of the greenhouse concept, warming preceded the CO2 spike by about 3,000 years and may have been initiated by a comet impact. By the late 1970s, the cooling scare had tapered off and Schneider was actively promoting AGW. The energy crisis, which began in 1973, put energy policy in the center of the political debate. In response, the left adopted a platform of conservation, renewables, and solar energy. Schneider and others noticed that AGW provided an additional justification for this platform. After Schneider abandoned his global cooling hobbyhorse and got on the global warming bandwagon, he never looked back. He was all about offering up "scary scenarios" in order to get "loads of media coverage." He had hoped to be honest, but, let's face it, nobody's perfect. Since he presents himself here as the high priest of climate science, it should be noted that Schneider's Ph.D. is in mechanical engineering. The Intergovernmental Panel on Climate Change, a UN agency that reports on climate science, was founded in 1988. IPCC reports are often cited as the gold standard of science in this field, proof that AGW is "settled science." But few journalists read the report itself. Instead, they rely on the "Executive Summary" or "Summary for Policymakers." This document is written, not by scientists, but by UN bureaucrats under the supervision of Rajendra Pachauri, the Indian railway economist who heads the IPCC. The Climategate II emails reveal that the summary is written first then material is added to the various chapters to support it. This procedure makes a farce of the IPCC's stated mission, which is to review the published literature so as to determine the scientific consensus. As for the main report, this is put together carelessly, according George Filippo: "I feel rather unconfortable about using not only unpublished but also unreviewed material as the backbone of our conclusions (or any conclusions)....IPCC is not any more an assessment of published science (which is its proclaimed goal) but production of results....I feel that at this point there are very little rules and almost anything goes." Filippo was a vice chair of the group from 2002 to 2008 and has contributed to all five IPCC reports. The AGW industry was exposed as a hoax by the release of the "Climategate" emails in 2009. The Climate Research Unit of East Anglia University in Britain prepared 156 megaybytes of email by their researchers for release under the Freedom of Information Act. This database was somehow leaked, either prematurely or by a whistleblower after the institution had second thoughts. In the most notorious message, Phil Jones, director of the unit, wrote, "I've just completed Mike's Nature trick of adding in the real temps to each series for the last 20 years (ie from 1981 onwards) amd from 1961 for Keith's to hide the decline." This should not be understood to mean that real temperature was declining, but rather that the researchers were attempting to cover up flaws in their tree-ring based data set. The graph in question was a version of the famous "hockey stick" that shows global temperature constant for 2,000 years, followed by a dramatic warming in the last century. Nature is considered one of the most authoritative science journals. So this quote suggests that a chart prepared for the magazine was faked with the approval of Jones as supervisor. An email by CRU researcher Tim Osborn clarifies what the Nature trick was: "Also we have applied a completely artificial adjustment to the data after 1960, so they look closer to observed temperatures than the tree-ring data actually were." What's wrong with using tree ring data to created a climate record? The CRU researchers assumed that a tree grows faster when it's warmer. But rainfall has a stronger influence on tree growth than temperature does. Temperature is coorelated to tree growth only in the sense that it tends to rain more in warm eras. Critics call the CRU's approach the "tree-o-meter" theory. In another Climategate email, Jones enthusiastically demands that the IPCC review process be rigged: "I can't see either of these papers being in the next IPCC report. Kevin and I will keep them out somehow - even if we have to redefine what the peer-review literature is!" Jones also admitted that the reason he claims the Earth is warming is political: "The scientific community would come down on me in no uncertain terms if I said the world had cooled from 1998. Okay it has but it is only seven years of data and it isn't statistically significant." Jones is ignoring the fact that 1998 was an unusually warm year due to an El Niño event. All the same, it's clear that he runs the CRU to produce made-to-order results rather than as a scientist. Global temperatures are tracked by three methods: satellites, weather balloons, and weather stations. All three methods confirm a modest amount of warming in recent decades. Satellite data shows a warming trend of 0.11 K/decade for 1978 to 2015. Weather balloon data shows a warming trend of 0.18 K/decade for 1970 to 2015. A reanalysis of weather station data for 1943 to 2012 by Roy Spencer shows that after a cooler period in the 1960s and 1970s, U.S. temperatures returned to their earlier level. Unlike CRU, NASA, and NOAA, Spencer corrects for the fact that at most stations measurement time of day has changed over the years. So Spencer's analysis implies that the warmest year on record was 1934, the warmest year of the 1930s, not 2016 as the climate establishment maintains. Spencer is a prominent skeptic and a professor at the University of Alabama in Huntsville. He maintains the UAH record, one of the two major satellite temperature records. As an active researcher at the center of the climate science community, Spencer is a standing rebuke to the claim that AGW represents the scientific consensus. The temperature records preferred by the climate establishment were built up over many years and include numerous gaps, bugs, incompatible coding, and other errors. The problems of the CRU data set are memorably documented in the "Harry read me" file, part of the Climategate trove. According to this file, the premier global temperature record contains, "botch after botch after botch." AGW is hardly the only explanation that has been proposed for recent warming. There are also explanations involving natural cycles such as the 11-year-sunspot cycle, the Pacific decadal oscillation, and the El Niño-Southern Oscillation (ENSO). Natural periods of global warming and global cooling are expected to occur regardless of human activity, and not long ago liberals were demanding more government control to combat an alleged cooling in temperatures, with some scientists warning of a possible ice age. Global cooling, a theory that predates global warming, obviously occurs naturally many times throughout Earth's geological history. The ease of refutation of anthropogenic global cooling claims foretells the eventual fate of the current global warming hysteria. Many political activists use the term "global warming" to refer to anthropogenic global warming theory (AGW), which asserts that human activity such as spewing "greenhouse gases" is causing an increase in temperature and is more significant than natural causes. The AGW theory is supported by left-leaning political parties, as well as a majority of sovereign states, national agencies, and an intergovernmental panel (see IPCC). The reality is that there is no immediate global crisis, and even dire warnings by the UN's Intergovernmental Panel on Climate Change (IPCC) admit that significant effects will not be manifested for at least 100 years. Predictions made by climate models publicized by the IPCC have not come to pass in recent years. Many scientists, such as Hal Lewis, have decried global warming as a conspiracy for the purpose of securing trillions of dollars in grant money. In November 2009, emails were disclosed that implicated a wrongful manipulation and concealment of data by scientists who have insisted that there is dangerous man-made global warming. Prior to ClimateGate, both the Republican and Democratic party Platforms in 2008 suggested that global warming is happening, that it is caused by human activity, and that it should be counteracted. For example, in 2007, the Republican presidential candidate Senator John McCain called global warming "an issue we can no longer afford to ignore". In 2010, an independent analysis cleared the scientists involved of any wrongdoing as scientists, but remarked upon their omissions as data-presenters. Accordingly, the effects of the scandal still linger. The following facts can help dissuade even the most illogical of liberals from believing in the flawed theory of anthropogenic global warming. The overall temperature has been flat for about 16 years. Climate data stating otherwise has been proven to be manipulated. Even if global warming did actually exist, the overall effect of human activities on global warming are minimal, if not nonexistent. One of the primary concerns of Global Warming research is the increased presence of carbon dioxide (CO2) in the atmosphere. Original claims stated that the increase in carbon dioxide—which is a greenhouse gas—were caused primarily through the burning of fossil fuels, and that such increases were the foremost cause of global temperatures rising. Historically, Global temperature changes precede changes in carbon dioxide in the atmosphere. The most obvious way that this would occur would be through the heating of ocean water. The oceans are the single largest storage unit for carbon dioxide gas on the planet, containing about 93% of the Earth's carbon dioxide. As the temperature rises, the solubility of carbon dioxide in ocean water is reduced, causing the dissolved carbon dioxide gas to enter the atmosphere, and begin trapping radiation from the sun. Scientists now believe that this cycle causes a sort of chain effect, where increased temperature causes more carbon dioxide to enter the atmosphere, which in turn causes more temperature rise. It is also noteworthy to point out that carbon dioxide, while not as abundant in the atmosphere, has a more significant effect on global warming than water vapor does. Carbon dioxide cannot form clouds, as water vapor does. When water vapor forms clouds, those clouds actually block some of the sun's radiation from reaching the Earth, causing water vapor to both contribute positively and negatively to global temperature rise. Carbon dioxide can only act as a greenhouse gas, causing the above-mentioned cyclic effect. According to the IPCC and others, the current concentration of carbon dioxide in the Earth's atmosphere is about 392 ppm, which is the highest it has been in at about 800,000 years. Take Warsaw-based Professor Zbigniew Jaworowski, famous for his critiques of ice-core data. He’s devastating on the IPCC rallying cry that CO2 is higher now than it has ever been over the past 650,000 years. In his 1997 paper in the Spring 21st Century Science and Technology, he demolishes this proposition. In particular, he’s very good on pointing out the enormous inaccuracies in the ice-core data and the ease with which a CO2 reading from any given year is contaminated by the CO2 from entirely different eras. He also points out that from 1985 on there’s been some highly suspect editing of the CO2 data, presumably to reinforce the case for the "unprecedented levels" of modern CO2. In fact, in numerous papers prior to 1985, there were plenty of instances of CO2 levels much higher than current CO2 measurements, some even six times higher. He also points out that it is highly unscientific to merge ice-core temperature measurements with modern temperature measurements. According to temperature reconstruction made within an Old Earth paradigm, there have been many cycles of naturally-caused global warming and cooling over many millions of years (see climate cycles). Some scientists, including Richard Lindzen of MIT, Sallie Baliunas of Harvard and Fred Singer (independent), say that the recent warming could be part of another natural cycle or random fluctuations in the atmosphere. While combinations of natural forcings produce a gradual warming up to about 1960, none of them leads to a warming over the last 30 years (this period containing three major volcanic eruptions). In contrast, simulations incorporating only anthropogenic forcings reproduce the warming over the last three decades at a rate consistent with that observed, but underestimate the early 20th century warming. As a consequence, only the use of both natural and anthropogenic forcings allows to reproduce much of the observed decadal scale variations of the annual mean hemispheric temperature over the last 150 years. It should be noted, however, that computer simulated climate models are often tweaked so they agree with the historical temperature record. There is no way to completely simulate all of the Earth's climate with a computer program. 'Natural variability [the impact of factors such as long-term temperature cycles in the oceans and the output of the sun] has been shown over the past two decades to have a magnitude that dominates the greenhouse warming effect. If the Sun were the only climate forcing or the dominant climate forcing, then the planet would gain energy during the solar maxima, but lose energy during solar minima. The fact that Earth gained energy at a rate 0.58 W/m2 during a deep prolonged solar minimum reveals that there is a strong positive forcing overwhelming the negative forcing by below-average solar irradiance. That result is not a surprise, given knowledge of other forcings, but it provides unequivocal refutation of assertions that the Sun is the dominant climate forcing. But heat energy is not the only force of the Sun affecting the Earth. The Sun also produces magnetic activity, the effect of which was not measured in this study, and which could affect the Earth's climate in little-understood ways. British astrophysicist Piers Corbyn, speaking in May 2017, claimed that low sunspot activity heralds a mini ice age which could last for 20 years. While the marriage of anti-capitalists and alleged climate science is nothing new, Rep. Alexandria Ocasio-Cortez has introduced legislation as part of her Green New Deal, reparations for minorities, a basic income, and Medicare for All as part of her "climate justice" program. The idea of dangerous anthropogenic (man-made) global warming (AGW) is promoted by liberals and socialists seeking greater government control over the production and use of energy, which is a substantial percentage of the economy. In economic terms, they would like to 'internalize' the 'externality,' which is to say that they think that producers of emissions should be directly connected to the consequences of those emissions, leading syndicated columnist Charles Krauthammer to warn of an impending "environmental shakedown". now we have the Church of Global Warming, under the leadership of Pope Albert I and his college of cardinals (the Natural Resources Defense Council, Sierra Club and editorial board of The New York Times). Its Office for the Propagation of the Faith works overtime, churning out books, movies (from the fictional “The Day After Tomorrow” to the fictional “An Inconvenient Truth”), textbooks, concerts, congressional hearings, media pleading and inquisitions. Commenting on the tendency to hastily issue dire warnings of Climate Change, seen in the coming Ice Age scare of the 70's, Maurizio Morabito asked, "Is the problem with the general public, who cannot talk about climate except in doom-laden terms, and for whom the sky is the last animist god?" Anti-humanism is everywhere, not least in the barely concealed admiration for China’s (demographically disastrous) “One Child” policy advanced by everyone from the National Post’s Diane Francis to Sir David Attenborough, the world’s leading telly naturalist but also a BBC exec who once long ago commissioned the great series The Ascent of Man. If Sir David’s any guide, the great thing about man’s ascent is it gives him a higher cliff to nosedive off. For a more detailed treatment, see Politics of global warming. The need to fight "global warming" has become part of the dogma of the liberal conscience. Clearly, "global warming" is a tempting issue for many very important groups to exploit. ... dealing with the threat of warming fits in with a great variety of preexisting agendas [like] dissatisfaction with industrial society (neopastoralism), ... governmental desires for enhanced revenues (carbon taxes), and bureaucratic desires for enhanced power. What’s also changed since the seventies is the nature of the UN and the transnational bureaucracies...“Aid” is a discredited word these days and comes with too many strings attached. But eco-credits sluiced through an oil-for-food program on steroids offers splendid new opportunities for bulking up an ambitious dictator’s Swiss bank accounts. The IPCC is desperate to claim the 20th century—the warmest on record. Thus, tying the progress of modern mankind to our supposed planet imbalance problem. Unfortunately for the IPCC, that point is disputed as well. In 2008, it was discovered that tree rings in Finland were more accurate record of the warmest century. The current era was not the warmest period—it was the period between 931 and 1180. Assessments of climate science by the United Nations (see IPCC — Intergovernmental Panel on Climate Change) have claimed that scientists are 90% sure that over 50% of the observed global warming in recent decades is human-caused, and that continued global warming should be expected over at least the next century. Perhaps more important are the pressures being brought to bear on scientists to get the "right" results. Such pressures are inevitable, given how far out on a limb much of the scientific community has gone. The situation is compounded by the fact that some of the strongest proponents of "global warming" in Congress are also among the major supporters of science (Sen. Gore is notable among those). Christopher Monckton wrote an article entitled "Climate sensitivity reconsidered" which states that the Intergovernmental Panel on Climate Change studies are flawed. The present analysis suggests the models failure to predict other climatic phenomena arises from defects in its evaluation of radioactive forcing, no-feedbacks climate sensitivity parameter and feedback multiplier. In conclusion, that there may be no "Climate Crisis" and for governments to reduce emissions may be pointless or even harmful. This was published on a forum of the American Physical Society with the following disclaimers: "The article has not undergone any scientific peer review" and "the APS disagrees with the article's conclusions". In fact, the APS disagrees with the article without ever reviewing it. A doctoral student at the Department of Meteorology at Florida State University did a study of global tropical cyclone activity. Its conclusions state that global warming might be greatly overblown. Mr. Maue found that tropical cyclone activity worldwide "has completely and utterly collapsed" during the past two to three years with energy levels sinking to those of the late 1970s. In late 2008, the AP published an article by its Science Writer Seth Borenstein, which is seen by skeptics as another example of one-sided, uncritical reporting on the issue by liberal media. The report stated that global warming was "a ticking time bomb that President-elect Barack Obama can't avoid", and that "We're out of time", with Al Gore calling the situation "the equivalent of a five-alarm fire that has to be addressed immediately." In response, Fox News (December 16, 2008) reported that scientists skeptical of anthropogenic global warming criticized the report as "irrational hysteria," "horrifically bad" and "incredibly biased", containing sweeping scientific errors and being a one-sided portrayal of a complicated issue. Geology professor David Deming stated, "If the issues weren't so serious and the ramifications so profound, I would have to laugh at it", and accused Borenstein of "writing a polemic and reporting it as fact." Deming noted that "the mean global temperature, at least as measured by satellite, is now the same as it was in the year 1980. In the last couple of years sea level has stopped rising. Hurricane and cyclone activity in the northern hemisphere is at a 24-year low and sea ice globally is also the same as it was in 1980." The AP responded to criticism by stating that, "It’s a news story, based on fact and the clearly expressed views of President-elect Barack Obama and others." Also in the discussion of the biased AP report, Michael R. Fox, a retired nuclear scientist and chemistry professor from the University of Idaho stated, "There is little evidence to believe that man-made carbon dioxide is causing temperature fluctuation. Other factors, including sun spots, solar winds, variations in the solar magnetic field and solar irradiation, could all be affecting temperature changes." The year 2008 turned out to be the coolest year since 2000, yet the seventh to tenth warmest year on record, according to the NASA Goddard Institute for Space Studies. According to a preliminary analysis by NOAA's National Climatic Data Center, the average June–August 2009 summer temperature for the contiguous United States was below average—the 34th coolest on record. Richard S. Courtney, a U.N. Intergovernmental Panel on Climate Change (IPCC) expert reviewer and a U.K.-based climate and atmospheric science consultant says "Rubbish! Global warming is not 'accelerating," and "...that anybody who proclaims that 'Global warming is accelerating' is a liar, a fool, or both." Don J. Easterbrook, Ph.D., emeritus professor of geology at Western Washington University, asked, "What does it take to ignore 10 years of global cooling....? The answer is really quite simple—just follow the money!" The more religious an individual is, the more likely they are to disbelieve in global warming. In 2014, whereas 80% of American atheists believed in climate change, only 56% of all very religious Americans did. In 2014, 86% of Democrats accepted climate change, whereas half of all Republicans disbelieve in global warming. In 2008 86 evangelical pastors, including Rev. Dr.Rick Warren signed a statement titled "Climate Change: An Evangelical Call to Action", which called on Christians to acknowledge the moral importance of action to counteract man-made climate change. the statement includes specific support for market-based CO2 reductions such as a cap-and-trade program. In contrast, a group of evangelical scholars, comprised of scientists, economists and theologians, contend that the liberal view of pending catastrophe caused by climate change is misleading and/or exaggerated. In April 2016 science popularizer "Bill Nye the Science Guy" took the debate up to the "put your money where your mouth is" level. He issued two bets, of $10,000 each, with Joe Bastardi, a "climate change contrarian" and frequent critic of Nye. One bet was that "2016 will be in the top 10 of hottest years on record", and that "this current decade will be the warmest ever recorded". As of late May Mr. Bastardi has not taken up the offer. For a more detailed treatment, see Climategate. The Climategate scandal revealed how liberal scientists appeared to be deceiving the public with the use of fraudulent data for use as climate science. The liberal media has attempted to bury the story and discount it as the work of computer hackers illegally stealing data, however, Freedom of Information requests is likely what led to the data being leaked — intentionally. Dr. Willie Soon, a physicist, astronomer and climate researcher at the solar and stellar physics division of the Harvard University-Smithsonian Center for Astrophysics, said in an interview, "[The Climatic Research Unit climate scientists] are making scientific progress more difficult now. This is a shameful, dark day for science." Dr. Soon also suggested that there has been systemic suppression of dissenting opinion among scientists in the climate change community, ranging from social snubs to e-mail stalking and even threats of harm. Al Gore's Schlockumentary under fire; An Inconvenient Truth found to be an inconvenient lie based on junk science and digitally enhanced, totally faked scenes of polar icecaps melting. Reports of a scientific "consensus" among scientists are similar to their one-sided support of other liberal policies and beliefs. For example, nearly 100% of political donations from professors are to Democrats rather than Republicans. Similarly, according to NASA, 97% of climate scientists believe that climate-warming trends over the past century are very likely due to human activities. These liberal scientists believe, or say they believe, that the Earth is warming overall, and that this warming, as well as other changes in climate patterns, is largely caused by human activities. These allegations do not necessarily make the consensus true, as discussed throughout the referenced citation. Numerous scientists, especially those outside of university faculties, have been critical of anthropogenic global warming. However, according to some researchers, scientists who do not support the anthropogenic global warming theory offer a general lack of comparative credentials; proponents of man-made global warming argue that this has led to agreement that, among authorities in scientific disciplines, there is a "scientific consensus" supporting the theory for greater government control. Scientists skeptical of the theory question whether there is a financial incentive for supporting research. It has also been documented that on most college campuses criticism of the global warming theory is silenced or censored; evidence shows that scientists skeptical of AGW are being suppressed. It is well understood that most media companies do not offer balanced reporting. Many politicians have bought into the liberal claim of consensus, for example Barack Obama's views, "Few challenges facing America and the world are more urgent than fighting climate change. The science is beyond dispute and the facts are clear." In fact, many scientists disagree with the "facts," their certainty, and their interpretation. Over 100 of them have signed the statement that appears in the Cato Institute's newspaper ad. Liberals have failed to back up their claims with any scientific facts. According to 80 graphs published in 58 peer-reviewed scientific papers in the first five months of 2017 alone, catastrophic anthropogenic global warming does not exist. By October 2017, the number of peer-reviewed papers rejecting global warming had increased to 400. Richard Lindzen wrote in 1992 on the doubtfulness of man-caused warming on Earth. The campaign to convince the public (and their elected representatives) that the "science is settled" began in 1988 or 1989. By the 2008 elections both candidates for the Presidency of the United States were proposing plans to mitigate climate change. Over 31,000 American scientists have signed the petition rejecting global warming. In June, 1974, Time magazine published its front-page article, Science: Another Ice Age?, while a report by the CIA in the same year stated that, "The western world's leading climatologists have confirmed recent reports of a detrimental global climatic change”, noting such things as that the "world's snow and ice cover had increased by at least 10 to 15 percent", and in the "Canadian area of Arctic Greenland, below normal temperatures were recorded for 19 consecutive months", which was unique during the last 100 years. A "major climatic shift" was speculated, which would threaten the "the stability of most nations.” It further warned that "Scientists are confident that unless man is able to effectively modify the climate, the northern regions, such as Canada" to "major areas in northern China, will again be covered with 100 to 200 feet of ice and snow", within the next 2500 years—or sooner. Also in 1974, Nigel Calder, former editor of New Scientist and atmospheric researcher wrote in his book The Weather Machine, "One might argue that there is a virtual certainty of the next ice age starting some time in the next 2000 years. Then the odds are only about 20-to-1 against it beginning in the next 100 years." In 1975 the liberal magazine Newsweek reported that "Meteorologists disagree about the cause and extent of the cooling trend,...but they are almost unanimous in the view that the trend will reduce agricultural productivity for the rest of the century." These authorities were skeptical that political leaders would take any positive action to compensate for the climate change, and they conceded that the more dramatic solutions, such as melting the arctic ice cap, might create worse problems than that which they were designed to solve. It is virtually universally accepted amongst secular climatologists that the earth has experienced numerous ice ages over two million years, during which global temperatures fluctuated created glacial and inter-glacial periods. The frigid temperatures allowed ice sheets to expand southward, covering much of Asia, Europe, and North America. The cooling associated with ice ages is gradual, while the terminations are relatively rapid. However, even the rapid terminations of ice ages take centuries to millennia. Since the Viking spacecraft reached Mars in the 1970s until recent readings were taken, the average temperature on Mars has risen 0.6 °C [1.1 °F] just as the average temperature on the earth has risen. Since human industrialization is clearly not to blame for the change on Mars, other causes are being considered. One possibility is that dust storms are changing the albedo of the planet, allowing it to warm, while another possibility is that solar variations from the sun are causing the warming. Recently, it has also been found that similar to the Earth and Mars, Neptune is also undergoing global warming. Measurements taken at the Lowell observatory in Arizona have shown an increase in Neptune's brightness and temperature since 1980 following the same pattern seen on Earth and Mars. The researchers who discovered this warming suggest there may be a correlation between the warming and solar variations. Pluto has also been found to be undergoing global warming. The overall temperature increase on Pluto has been greater than that on the earth. On the other hand, Uranus has had no net change in temperature since 1977. A rapid increase in temperature reversed itself. The reasons for this are not understood. Global temperatures change on other planets even when there is no life, something which strongly supports the idea that humans are not necessarily the cause of earth's global warming. Moreover, the temperature on Uranus has fluctuated back and forth. There is no reason that fluctuations cannot occur on earth, too. Although measurements have been made of the temperatures of other planets these are by no means thorough or comparable with the measurements used for earth. The short space of time over which measurements have been taken and the very limited spatial coverage means that reliable average figures have not been obtained. They have certainly not been taken extensively enough to produce a five-year average temperature, which is the standard when determining temperature trends on earth. However, if accurate measurements could be made, and their accuracy and reliability is improving over time, then they may prove useful to climate science. Their different atmospheres and distances from the sun provide natural laboratories to study climatic changes without human influences. Though of course they will not be directly comparable due to the vast differences. The decision by the government to distribute Al Gore's film, An Inconvenient Truth, became the subject of a legal challenge by New Party member Stewart Dimmock. A school governor from Dover and father of two, Dimmock charged the Government with brainwashing children with propaganda by presenting Gore's sci-fi film as science. In October 2007, Mr Justice Burton of London's High Court found that while the film was "broadly accurate", it contained nine significant errors,“in which statements were made that were not supported by the current mainstream scientific consensus”, some of which had arisen in “the context of alarmism and exaggeration”. He also found the Guidance Notes drafted by the Education Secretary's advisers only worked to exacerbate the political propaganda in the film. 1. Sea level rise of up to 20 feet (7 metres) will be caused by melting of either West Antarctica or Greenland in the near future. This is distinctly alarmist, and part of Mr Gore's 'wake-up call'. It is common ground that if indeed Greenland melted, it would release this amount of water, but only after, and over, millennia, so that the Armageddon scenario he predicts, insofar as it suggests that sea level rises of 7 metres might occur in the immediate future, is not in line with the scientific consensus. 2. Low lying inhabited Pacific atolls are being inundated because of anthropogenic global warming. In scene 20, Mr Gore states "that's why the citizens of these Pacific nations have all had to evacuate to New Zealand". There is no evidence of any such evacuation having yet happened. 3. Shutting down of the "Ocean Conveyor". According to the IPCC, it is very unlikely that the Ocean Conveyor (known technically as the Meridional Overturning Circulation or thermohaline circulation) will shut down in the future, though it is considered likely that thermohaline circulation may slow down. 4. Direct coincidence between rise in CO2 in the atmosphere and in temperature, by reference to two graphs. 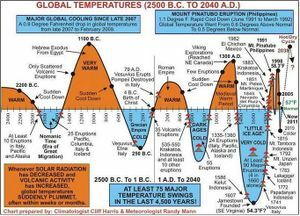 In scenes 8 and 9, Mr Gore shows two graphs relating to a period of 650,000 years, one showing rise in CO2 and one showing rise in temperature, and asserts (by ridiculing the opposite view) that they show an exact fit. 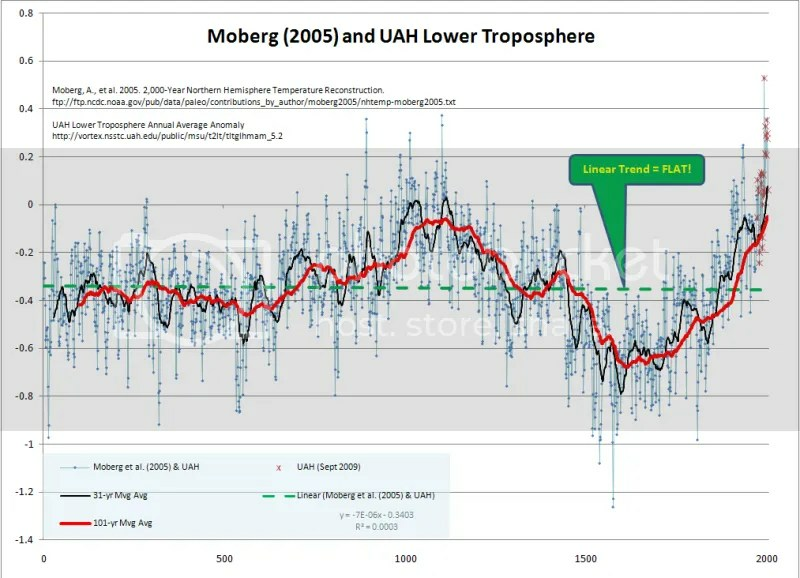 Although there is general scientific agreement that there is a connection, the two graphs do not establish what Mr Gore asserts. 5. The snows of Kilimanjaro. The film asserted that melting snows on Mount Kilimanjaro evidenced global warming. The Government's expert was had to admit that this is not correct. Mr Gore asserts in scene 7 that the disappearance of snow on Mt Kilimanjaro is expressly attributable to global warming. It is noteworthy that this is a point that specifically impressed Mr Milliband (see the press release quoted at paragraph 6 above). However, it is common ground that, the scientific consensus is that it cannot be established that the recession of snows on Mt Kilimanjaro is mainly attributable to human-induced climate change. 6. Lake Chad etc. The drying up of Lake Chad is used as a prime example of a catastrophic result of global warming. However, it is generally accepted that the evidence remains insufficient to establish such an attribution. It is apparently considered to be far more likely to result from other factors, such as population increase and over-grazing, and regional climate variability. 7. Hurricane Katrina. In scene 12 Hurricane Katrina and the consequent devastation in New Orleans is ascribed to global warming. It is common ground that there is insufficient evidence to show that. 8. Death of polar bears. In scene 16, by reference to a dramatic graphic of a polar bear desperately swimming through the water looking for ice, Mr Gore says: "A new scientific study shows that for the first time they are finding polar bears that have actually drowned swimming long distances up to 60 miles to find the ice. They did not find that before." The only scientific study that either side before me can find is one which indicates that four polar bears have recently been found drowned because of a storm. 9. Coral reefs. In scene 19, Mr Gore says: "Coral reefs all over the world because of global warming and other factors are bleaching and they end up like this. All the fish species that depend on the coral reef are also in jeopardy as a result. Overall specie loss is now occurring at a rate 1000 times greater than the natural background rate." The actual scientific view, as recorded in the IPCC report, is that, if the temperature were to rise by 1-3 degrees Centigrade, there would be increased coral bleaching and widespread coral mortality, unless corals could adapt or climatize, but that separating the impacts of climate change-related stresses from other stresses, such as over-fishing and polluting, is difficult. Dimmock's lawyer, Mr. Downes, argued that by schools making available such film to its teachers, and if teachers then showed such film to their pupils, then this would inevitably result "in the promotion of partisan political views in the teaching of any subject in the school, which is thus not only not being forbidden by the local education authority (and the DES), but being positively facilitated by them." Mr Justice Barton stressed that the “apocalyptic vision” presented in the film was politically partisan and not an impartial analysis of the science of climate change. “It is now common ground that it is not simply a science film—although it is clear that it is based substantially on scientific research and opinion—but that it is a political film. 1. The Film is a political work and promotes only one side of the argument. 2. If teachers present the Film without making this plain they may be in breach of section 406 of the Education Act 1996 and guilty of political indoctrination. 3. Nine inaccuracies have to be specifically drawn to the attention of school children. Science and Public Policy took issue with the response to the ruling by Al Gore's spokesman and environment adviser, and asserted that his film contains 35 Inconvenient Truths. Although it's tempting to blame the ice loss on global warming, researchers think that deforestation of the mountain's foothills is the more likely culprit. Without the forests' humidity, previously moisture-laden winds blew dry. No longer replenished with water, the ice is evaporating in the strong equatorial sunshine." Many conservatives see Al Gore as an example of liberals using deceitful tactics in important debates, in order to make a position seem more solid than it is. Liberal claims of global warming led to the resignation in October 2010 by Professor Hal Lewis from The American Physical Society because of "the global warming scam, with the (literally) trillions of dollars driving it, that has corrupted so many scientists, and has carried APS before it like a rogue wave. It is the greatest and most successful pseudoscientific fraud I have seen in my long life as a physicist." Stephen McIntyre and Ross McKitrick, "Corrections To The Mann et. al. (1998) Proxy Data Base And Northern Hemispheric Average Temperature Series, Energy & Enviornment volume 14, 2003. Dalmia, Shikha (December 2, 2009). "Cringing over Climategate". Forbes website. Retrieved on September 25, 2014. Taylor, James (November 23, 2011). "Climategate 2.0: New e-mails rock the global warming debate". Forbes website. Retrieved on September 25, 2014. Bailey, Ronald (December 26, 2012). "34 years of satellite temperature data show global warming is on a plateau". Hit & Run Blog/Reason.com. Retrieved on September 25, 2014. Cole, Steve and McCarthy, Leslie (January 12, 2011). "NASA research finds 2010 tied for warmest year on record". NASA website. Retrieved on September 25, 2014. Canoing on a Colorful Day, (NY). Some researchers point out that benefits of health global warming have been overlooked, or minimized. As far back as 1996, Thomas Gale Moore, Senior Fellow at Hoover Institution (Stanford University) contended that positive health and amenity effects would be a result of projected increases in temperature. In areas that see extreme cold temperatures, deaths related to colder weather would drop significantly, leading to decreased health care costs, while areas that already have hot climates will see no increase. Warmer temperatures would also mean less energy use to heat homes and buildings, helping to conserve energy as cooling is much more energy efficient. With the changes brought about by global warming more land that is not lost to desert and/or rising sea levels would become available for uses like farming and living. Forests and plants would grow stronger, healthier, and more abundant because of the warmer weather, and this would mean more oxygen being released into the atmosphere. Reported past or expected/possible future environmental and societal consequences of man-made global warming include global cooling, decreased food production, increased food production, shrinking forest., increased tree foliage, increased productivity of high-elevation forests, melting glaciers., growing glaciers, increasing landmass in Antarctica, colder winters, a new ice age, prevention of an ice age, taller mountains., a lop-sided planet, stronger hurricanes, weaker hurricanes, shorter days, earthquakes and volcanoes, and other geological disasters. Attempts to prevent climate change may do the same, shrinking brains, shrinking sheep, tiger attacks., shark attacks, walrus stampede deaths, imminent cannibalism, the need for a drastic reduction of the earth's population, a strong increase in people dying of AIDS, increased risk of civil war in Africa, child climate cops, increase in depression, increase in psychiatric illness and increased anxiety and loss of sleep among many children. ↑ "The Climate Surprise Pamphlet", The New Criterion, 2016. Taken from chart "All 3 Global Temperature Dataset Types Disagree with the Climate Model During the Period of Greatest Greenhouse Concentration." ↑ "The Climate Surprise Pamphlet", The New Criterion, 2016. ↑ Spencer, Roy, "Global Temperature Report: January 2019", 2019. This is data from the University of Alabama in Huntsville. ↑ "RATPAC-A-annual-levels.txt.zip", NOAA, National Centers for Environmental Information. Based on data for 850-300 mb. ↑ 5.0 5.1 Spencer, Roy, "A New Analysis of U.S. Temperature Trends Since 1943," August 6th, 2012. ↑ "New Study Shows Past Research On Rising Ocean Temps Built On Faulty Science," The Daily Caller, 01/05/2018. ↑ "Plant growth enhanced by increased carbon dioxide, but food webs give rise to significant variations", Science News, December 10, 2015. Harrison H. Schmitt and William Happer, "In Defense of Carbon Dioxide," Wall Street Journal, May 8, 2013. ↑ Roberts, Greg (April 18, 2009). "Antarctic ice is growing, not melting away." News.com.au. Retrieved on September 25, 2014. ↑ "Dark Ages Cold Period (Europe) - Summary", CO2 Science, 1 June 2005. ↑ John P. Rafferty, Stephen T. Jackson, "Little Ice Age (LIA)", Britannica. ↑ See the graphs at "Global temperatures," Climate4you. ↑ Bastasch, Michael, "Study: Earth was warmer in Roman, Medieval times", The Daily Caller. For a peer-reviewed paper, see Moberg, A., et al. 2005 "2,000-Year Northern Hemisphere Temperature Reconstruction", World Data Center for Paleoclimatology. The Moberg data set is charted here. ↑ "The corrupt history of NASA temperature history", Real Climate Science. ↑ 17.0 17.1 17.2 "Science: Another Ice Age?" (June 24, 1974). Time magazine. Retrieved on September 25, 2014. ↑ This is from an article Schneider wrote for Discover magazine in 1989. ↑ Carrington, Damian, "Dumping iron at sea can bury carbon for centuries, study shows" The Guardian, 18 July 2012. ↑ "Freeman Dyson on the Global Warming Hysteria April, 2015." Dyson recommends Cool It (2007) by Bjorn Lomborg as the best summary of the AGW issue. ↑ Muller, Richard A., "A Global Warming Bombshell", Technology Review , Oct. 2004; calls into question famous graph by Michael Mann. ↑ The legacy of the global Cold War economy can be seen in that the loosers of World War II - Germany and Japan - as of 2019 remain the world's largest auto manufactures. Germany and Japan were allowed to rebuild their economies around the automobile - provided the two refrained from competing in the global aircraft industry. World War II proved the military doctrine of the superiority of airpower - whoever controls the skies controls the ground. While Germany snd Japan do produce aircraft, including military aircraft, it is strictly for their domestic markets and not for export. Germany and Japan certainly have the manufacturing and technical capabilities to compete with Boeing, AirBus, Northrup Grumman and others, but by previous trade agreements are prohibited. By contrast, the United States, UK, France, Italy and others have ceded much of their domestic auto markets to German and Japanese manufactures. The fraud of the global warming hoax can be seen in the disproportionate lack of pressure on Germany and Japan to cease auto exports, as has been applied throughout the rest of the West. ↑ 25.0 25.1 Fourier, Jean Baptist Joseph, "On the Temperatures of the Terrestrial Sphere in Interplanetary Space", Translated in The Warming Papers: The Scientific Foundation for Climate Change Forecast. The relevant section is pp. 12-13. ↑ Arrhenius, Svante, "On the Influence of Carbonic Acid in the Air on the Temperature on the Ground", London, Edinburgh, and Dublin Philosophical Magazine and Journal of Science, April 1896. Reprinted in The Warming Papers, pp. 56-77. ↑ "Climate Scientists Celebrating 115 Years Of Debunked Junk Science"
↑ Ekholm, Nils, "On the Variations of the Geological and Historical Past their Causes, Quarterly Journal of the Royal Meteorological Society, January 1901. DOI: 10.1002/qj.49702711702. ↑ "The Surface budget fallacy," The Warming Papers, pp. 79-80. ↑ American Meteorological Society, 1951 Compendium of Meteorology, p. 1016. ↑ Wood, Robert, "Note on the Theory of the Greenhouse", Philosphical Magazine, January—June 1909. "Greenhouse Theory disproven in 1909, 1963, 1966, 1973...but still refuses to die," June 28, 2010. Gerhard Gerlich and Ralf D. Tscheuschner, "Falsification Of The Atmospheric CO2 Greenhouse Effects Within The Frame Of Physics"
↑ Callendar, G.S. (1938). "The Artificial Production of Carbon Dioxide and Its Influence on Climate." Quarterly J. Royal Meteorological Society 64: 223-40. Reprinted in The Warming Papers, pp. 261-273. ↑ Weart, Spencer, "Venus & Mars", June 2011. ↑ Sagan, Carl, "The Planet Venus", Science, 24 March 1961. ↑ AAAS Symposium: "Velikovsky's Challenge to Science" held on February 25, 1974. ↑ NASA's "Venus Fact Sheet" gives the planet's diurnal temperature range as zero, i.e. no difference between night and day on the surface. ↑ *Raymond T. Pierrehumbert, Principles of Planetary Climate, pp. 14-15. *Anthony Watts explains why Sagan's theory is "beyond absurd" in "Hyperventilating on Venus," May 6, 2010. ↑ Sullivan, John, "Top Scientists Vent on NASA’s Sub Prime Greenhouse Gas Hoaxer", May 20, 2012. "The oceans will begin to boil," Hansen announces in this video. In his book, Storms of my Grandchildren, Hansen writes: "[I]f we burn all reserves of oil, gas, and coal, there is a substantial chance we will initiate the runaway greenhouse. If we also burn the tar sands and tar shale, I believe the Venus syndrome is a dead certainty." ↑ Kunzig, Robert, "Will Earth's Ocean Boil Away? ", National Geographic, July 30, 2013. ↑ Sluijs, A.; Brinkhuis, H.; Schouten, S.; Bohaty, S.M. ; John, C.M. ; Zachos, J.C.; Reichart, G.J. ; Sinninghe Damste, J.S. ; Crouch, E.M.; Dickens, G.R. (2007). "Environmental precursors to rapid light carbon injection at the Palaeocene/Eocene boundary". Nature. 450 (7173): 1218–21. Bibcode:2007Natur.450.1218S. doi:10.1038/nature06400. PMID 18097406. ↑ Study: Extraterrestrial impact preceded ancient global warming event", October 13, 2016. Morgan F. Schaller, Megan K. Fung, James D. Wright, Miriam E. Katz, Dennis V. Kent, "Impact ejecta at the Paleocene-Eocene boundary", Science, 14 Oct 2016: Vol. 354, Issue 6309, pp. 225-229 DOI: 10.1126/science.aaf5466. ↑ Rasool SI, Schneider SH (July 1971). "Atmospheric carbon dioxide and aerosols: effects of large increases on global climate". Science 173 (3992): 138–41. doi:10.1126/science.173.3992.138. PMID 17739641. ↑ The quote is from Discover, pp. 45–48, October 1989. See this link. ↑ "In case you missed it, damning ClimateGate emails from Tim Osborne", Tom Nelson, Dec. 06, 2011. ↑ "Email 3826, Feb 2001," Tom Nelson, Feb. 04, 2012. "In one go, they tossed aside dozens of studies which confirmed the existence of the MWE [Medieval Warm Era] and LIA [Little Ice Age] as global events, and all on the basis of tree rings - a proxy which has all the deficiencies I have stated above." ↑ Steyn, Mark, "How the Science Got Settled", December 6, 2014. ↑ Roy W. Spencer, John R. Christy, and William D. Braswell, "Version 6.0 of the UAH Temperature Dataset Released", 28 April 2015. ↑ The figure given is for RATPAC-A, surface to 700 mb. See "Gavin’s admission about the satellite record versus the surface temperature record," Watt's Up With That. You can find a collection of global climate charts here. ↑ Spencer, Roy, "My Global Warming Skepticism, for Dummies"
↑ Brownlow, Andie, "Climategate's Harry_Read_Me.txt: We All Really Should", Dec. 11, 2009. ↑ Bratcher and Giese, "Tropical Pacific decadal variability and global warming", Geophysical Research Letters. ↑ 59.0 59.1 "After any given warming phase begins, thousands of years later the cyclical Milankovitch decrease in the sun's heat kicks in. The warming stops, reverses and an ice age ensues." Cockburn, Alexander (June 9–11, 2007). "Dissidents against dogma". Counterpunch. Retrieved on September 25, 2014. ↑ "Issues" (September 1, 2007). www.JohnMcCain.com [2008 senate campaign website] quoted in "John McCain on environment" OnTheIssues.org. Retrieved on September 25, 2014. ↑ Whiteman, Hilary (July 7, 2010). "'Climategate' review clears scientists of dishonesty". CNN World. Retrieved on September 26, 2014. ↑ 62.0 62.1 Rose, David (October 13, 2012). "Global warming stopped 16 years ago, reveals Met Office report quietly released...and here is the chart to prove it". MailOnline. Retrieved on September 26, 2014. KUSI-TV (January 14, 2010). "NASA caught in climate data manipulation; new revelations headlined on KUSI-TV climate special". SpaceRef. Retrieved on September 26, 2014. "Climategate 2-US Government involved in data manipulation" (January 16, 2010). YouTube video, 10:00, posted by Bigone5555J. Retrieved on September 26, 2014. ↑ Byrne, Dennis (August 30, 2011). "The real science trashers". ChicagoTribune. Retrieved on September 26, 2014. ↑ "CO2 lags temperature-what does it mean?" (2007). SkepticalScience. Retrieved on September 26, 2014. ↑ "Carbon cycle" (2010). NASA Science. Retrieved on September 26, 2014. ↑ Tans, Pieter and Keeling, Ralph (2010). "Trends in atmospheric carbon dioxide". NOAA/Earth System Research Laboratory Global Monitoring Division. Retrieved on September 26, 2014. ↑ Bertrand, Cédric, Loutre, Marie-France et al. (May 2002). "Climate of the last millennium: a sensitivity study". Tellus [Stockholm], vol. 54, iss. 3, pp. 221-244. Retrieved from Wiley Online Library on September 26, 2014. ↑ Hansen, James, Sato, Makiko et al. (January 2012). "Earth's energy imbalance" nasa.gov/Goddard Institute for Space Studies. Retrieved on September 26, 2014. ↑ Krauthammer, Charles (December 11, 2009). "The environmental shakedown". Real Clear Politics. Retrieved on September 27, 2014. ↑ Feder, Don (July 31, 2007). "The cult of global warming". GrassTopsUSA.com. Retrieved from archive at FrontPageMag.com on September 27, 2014. ↑ Morabito, Maurizio (December 5, 2009). "The CIA’s ‘global cooling’ file". The Spectator. Retrieved from The Spectator website on September 27, 2014. ↑ 76.0 76.1 Steyn, Mark (December 24, 2009). "Why climate change is hot hot hot". Macleans. Retrieved on September 27, 2014. ↑ Stewart, Christine (December 14, 1998). Calgary Herald. Reprinted at "Match these quotes" (December 2004). Resource Roundup, p. 8. Reprinted at "Use environmentalism to change the world". Accuracy in Media, "What liberals say" series. Retrieved on September 27, 2014. ↑ Sheppard, Noel (July 17, 2007). "Hysterical satire: 'Global warming now world's most boring topic'". MRC NewsBusters. Retrieved on September 27, 2014. ↑ 79.0 79.1 79.2 79.3 79.4 Lindzen, Richard (Spring 1992). "Global warming: The origin and nature of the alleged scientific consensus". Regulation, vol. 15, no. 2. Retrieved from Cato Institute website on September 29, 2014. ↑ Birdnow, Timothy (June 24, 2008). "The trees of Finland; temperature readings and historical reconstruction". Birdnow's Aviary blog. Retrieved on September 29, 2014. With links to actual data sources. ↑ Monckton, Christopher (July 2008). "Climate sensitivity reconsidered". Physics & Society newsletter. Retrieved from American Physical Society/Forum on Physics and Society website on September 29, 2014. ↑ Tribune-Review, The (March 21, 2009). "Global warming? More doubts". TribLive [Pittsburgh Tribune website]. Retrieved on September 29, 2014. ↑ Hendrickson, Mark W. (May 25, 2009). "A closer look at climate change". Townhall.com. Retrieved on September 29, 2014. "The panic over global warming is totally unjustified" says Vice Chair, IPCC. ↑ "Shocker: 'Global warming' simply no longer happening" (March 22, 2009). WND. Retrieved on September 29, 2014. ↑ Blumer, Tom (January 28, 2009). "Former boss rebukes NASA global warming alarmist Hansen, is AGW skeptic". MRC NewsBusters. Retrieved on September 29, 2014. ↑ Pogatchnik, Shawn (February 9, 2009). "Belfast environment chief bans climate change ads". Associated Press. Retrieved from CNSNews.com on September 29, 2014. ↑ Goodenough, Patrick (July 22, 2008). "UK broadcaster scolded for film on global warming". CNSNews. Retrieved on September 29, 2014. ↑ Borenstein, Seth (December 14, 2008). "Obama left with little time to curb global warming". Associated Press. Reprinted at Breitbart.com. Retrieved from December 15, 2008 archive at Internet Archive on September 29, 2014. ↑ "Scientists call AP Report on global warming 'hysteria'" (December 16, 2008). Fox News website. Retrieved on September 29, 2014. ↑ "2008 global temperature" (January 21, 2009). EO [Earth Observation]. Retrieved from July 25, 2011 archive at Internet Archive on September 29, 2014. ↑ "NOAA: Summer temperature below average for U.S." (September 10, 2009). NOAA. Retrieved on September 29, 2014. ↑ Brennan, Phil (December 16, 2008). "Global warming’s last gasp". NewsMax. Retrieved on September 29, 2014. ↑ Evangelical Climate Initiative (2006). "ECI Statement". Climate Change: An Evangelical Call to Action. Retrieved from February 1, 2014 archive at Internet Archive on September 29, 2014. ↑ Vu, Michelle A. (December 4, 2009). "Evangelicals push back against global warming doom" The Christian Post website. Retrieved on September 29, 2014. ↑ The Bill Nye climate change bet. ↑ JunkScience.com (December 12, 2009). Retrieved from December 12, 2009 archive at Internet Archive on September 29, 2014. ↑ Koprowski, Gene J. (December 1, 2009). "Global warming scandal makes scientific progress more difficult, experts say". Fox News website. Retrieved on September 30, 2014. See Fox News. ↑ NASA's Jet Propulsion Laboratory-California Institute of Technology Earth Science Communications Team (2013). "Consensus". NASA website/Global Climate Change. Retrieved on September 30, 2014. Anderegg, William R. L., Prall, James W. et al. (July 6, 2010). "Expert credibility in climate change." Proceedings of the National Academy of Sciences, vol. 107, no. 27, pp. 12107-12109. Retrieved from PNAS.org on September 30, 2014. "Working group I: The physical science basis/Summary for policy makers/Understanding and attributing climate change" (2007). IPCC Fourth Assessment Report: Climate Change 2007. Retrieved from Intergovernmental Panel on Climate Change website on September 30, 2014. ↑ Chesser, Paul (October 25, 2007). "Be wary of climate policy development". Seattle Post-Intelligencer website. Retrieved on September 30, 2014. O'Neill, Brendan (October 6, 2006). "Global warming: The chilling effect on free speech". Sp!ked. Retrieved on September 30, 2014. Schilling, Chelsea (June 24, 2009). "EPA's own research expert 'shut up' on climate change". WND. Retrieved on September 30, 2014. ↑ "Climate change reality" (March 2009). Cato Institute website. Retrieved on September 30, 2014. ↑ Delingpole, James (June 6, 2017). DELINGPOLE: ‘Global Warming’ Is a Myth, Say 58 Scientific Papers in 2017. Breitbart News. Retrieved June 7, 2017. ↑ Delingpole, James (October 24, 2017). Delingpole: Now 400 Scientific Papers in 2017 Say ‘Global Warming’ Is a Myth. Breitbart News. Retrieved October 24, 2017. ↑ George, Alison (June 28, 2001). "Breaking the ice". The Guardian website. Retrieved on September 30, 2014. See Guardian (UK). ↑ "Global warming petition project" (2008). Global Warming Petition Project. Retrieved on September 30, 2014. ↑ Central Intelligence Agency (August 1974). A Study of Climatological Research as it Pertains to Intelligence Problems, pp. 1, 5, 7, 16. Retrieved from Climatemonitor [Italy] on September 30, 2014. ↑ Gwynne, Peter (April 28, 1975). "The cooling world". Newsweek. Retrieved from DenisDutton.com on September 30, 2014. Caution: Copyrighted material; for fair educational use only. Than, Ker (April 4, 2007). "Dust storms fuel global warming on Mars". Space.com. Retrieved on September 30, 2014. Taylor, James M. (November 1, 2005). "Mars is warming, NASA scientists report". Heartlander Magazine. Retrieved on September 30, 2014. ↑ Hammel, H. B. and Lockwood, G. W. (April 8, 2007). "Suggestive correlations between the brightness of Neptune, solar variability, and Earth's temperature". Geophysical Research Letters. Retrieved from Wiley Online Library on September 30, 2014. ↑ Britt, Robert Roy (October 9, 2002). "Global warming on Pluto puzzles scientists". Space.com. Retrieved on September 30, 2014. ↑ Young, Leslie A., Bosh, Amanda S. et al. (October 2001). "Uranus after solstice: Results from the 1998 November 6 occultation". Icarus, vol. 153, iss. 2, pp. 236-247. Retrieved from Southwest Research Institute [Boulder, CO] website on September 30, 2014. Sheppard, Marc (July 14, 2009). "Clearly it's Al Gore who's in denial". American Thinker. Retrieved on October 1, 2014. Smith, Lewis (October 11, 2007). "Al Gore’s inconvenient judgment". The Times website. Retrieved on October 1, 2014. Fee required to see article. Smith, Lewis (October 11, 2007). "Al Gore’s inconvenient judgment". The Times website. Retrieved from University of Oslo/Faculty of Mathematics and Natural Science website on October 1, 2014. Caution: Copyrighted; for fair educational use only. ↑ Burton, Mr Justice Michael (October 10, 2007). "Stuart Dimmock and Secretary of State for Education and Skills". United Kingdom of Great Britain's High Court of Justice/Queen's Bench Division/Administrative Court. Retrieved from Not Evil Just Wrong on October 1, 2014. ↑ "Gore climate film's nine 'errors'" (October 11, 2007). BBC News website. Retrieved on October 1, 2014. ↑ "Inaccuracies in Al Gore's 'An Inconvenient Truth'" (October 2007). The New Party [U.K.]. Retrieved on October 1, 2014. ↑ Monckton, Christopher (October 19, 2007). "35 inconvenient truths: The errors in Al Gore's movie". The Science and Public Policy Institute website. Retrieved from September 15, 2014 archive at Internet Archive on October 1, 2014. ↑ Lewis, Hal (October 8, 2010). "Hal Lewis: My resignation from the American Physical Society". The Global Warming Policy Foundation website. Retrieved from February 12, 2014 archive at Internet Archive on October 1, 2014. ↑ Moore, Thomas Gale (May 30, 1996). "Health and amenity effects of global warming". Stanford University/Thomas Gale Moore webpage. Retrieved on October 1, 2014. ↑ "What are the benefits of global warming?" (November 3, 2008). Bionomicfuel.com. Retrieved from December 21, 2008 archive at Internet Archive on October 1, 2014. ↑ 72Jag (August 25, 2014). "Is global warming causing global cooling?" NowPublic. Retrieved on October 1, 2014. ↑ Fred Pearce (April 26, 2005). "Climate change warning over food production" Newscientist website. Retrieved on October 1, 2014. ↑ Booth, William (May 17, 1990). "Global heating could benefit U.S. farmers; prices seen rising as production falls". The Washington Post. Retrieved from HighBeam Research website on October 1, 2014. ↑ Adam, David (March 11, 2009). "Amazon could shrink by 85% due to climate change". Theguardian [U. K.]. Retrieved on October 1, 2014. See The Guardian. ↑ "Global warming causes greening" (2008). Greenfingers.com. Retrieved on October 1, 2014. ↑ Oregon State University (Oct. 20, 2009). "Global warming may spur increased growth in Pacific northwest forests". ScienceDaily. Retrieved on October 1, 2014. ↑ Asian News International (June 6, 2007). "Global warming causing hundreds of Antarctic Peninsula glaciers to melt". AndhraNews.net. Retrieved on October 1, 2014. ↑ "Global warming causing California glacier to grow, scientists say" (July 9, 2008). CBCnews. Retrieved on October 1, 2014. Located by Sub-Driver of Free Republic. ↑ "Antarctic ice: A global warming snow job?" (May 27, 2005). World Climate Report. Retrieved on October 2, 2014. ↑ "Climate change could bring colder winters" (March 13, 2003). CBCNews. Retrieved on October 2, 2014. ↑ McGuire, Bill (November 13, 2003). "Will global warming trigger a new ice age?" The Guardian website. Retrieved on October 2, 2014. ↑ Thompson, Andrea (September 10, 2007). "Global warming may cancel next ice age". Fox News website. Retrieved on October 2, 2014. ↑ Than, Ker (August 4, 2006). "Taller mountains blamed on global warming, too". LiveScience. Retrieved on October 2, 2014. ↑ Britt, Robert Roy (June 29, 2005). "Global warming might create lopsided planet". LiveScience. Retrieved on October 2, 2014. ↑ Florida State University (Sep. 4, 2008). "Global warming: Warmer seas linked to strengthening hurricanes, according to new research". ScienceDaily. Retrieved on October 2, 2014. ↑ Schmid, Randolph E., AP Science Writer (April 17, 2007). "Study: Global warming may diminish Atlantic hurricane activity". USA Today. Retrieved on October 2, 2014. ↑ Atkins, William (April 11, 2007). "Researchers say global warming should cause shorter days". iTWire. Retrieved on October 2, 2014. ↑ Fisher, Richard. (September 23, 2009). "Climate change may trigger earthquakes and volcanoes" [preview]. Newscientist website. Preview retrieved on October 2, 2014. Subscription required for full article. ↑ "Study: Global warming could be reversing a trend that led to bigger human brains" (March 15, 2007). State University of New York at Albany. Retrieved on October 2, 2014. ↑ Connor, Steve (July 3, 2009). "How global warming shrank St Kilda's sheep". The Independent [U. K.] website. Retrieved on October 2, 2014. ↑ Dhar, Sujoy (October 20, 2008). "Tiger attacks linked to global warming". Reuters. Retrieved from OneWorld South Asia on October 2, 2014. ↑ Johnston, Bruce (August 31, 1998). "Shark attack on boat 'result of global warming'". Electronic Telegraph (U.K.) Retrieved from JunkScienceArchive on October 3, 2014. ↑ Baker, Brent (April 2, 2008). "Turner: Global warming will cause mass cannibalism, insurgents are patriots". MRC NewsBusters. Retrieved on October 2, 2014. ↑ "One less child? Environmental extremists warn that overpopulation is causing climate change and will ultimately destroy the Earth" (November 17, 2009). The End of the World. Retrieved on October 2, 2014. ↑ McLean, Tamara (April 29, 2008). "Global warming hoax set to fan the HIV fire". Theage.com.au. Retrieved from August 31, 2011 archive at Internet Archive on October 1, 2014. Located by Skeptics Global Warning. ↑ "Global warming increases risk of civil war in Africa" (November 23, 2009). Stanford Report. Retrieved from Stanford News on October 1, 2014. ↑ "Beware your children: They might be 'climate cops'" (July 28, 2008). WND. Retrieved on October 1, 2014. ↑ Sohn, Emily (December 10, 2009). “Mental health to decline with climate change”. Discovery.com News. Retrieved from Google Search on October 1, 2014. ↑ Press Trust of India (April 8, 2008). "'Climate change leads to psychiatric illness'". Sify News. Retrieved on October 1, 2014. ↑ Jones, Alan (February 22, 2007). "Children losing sleep over global warming". The Scotsman website. Retrieved on September 30, 2014. The appliance of science by Mike Hulme. "Should We Have Acted Thirty Years Ago to Prevent Climate Change? ", by Randall G. Holcombe. "After Kyoto: A Global Scramble for Advantage," by Bruce Yandle. "New Perspectives in Climate Change: What the EPA Isn’t Telling Us"
"CO2 Fairytales in Global Warming"
This page has been accessed 646,404 times.